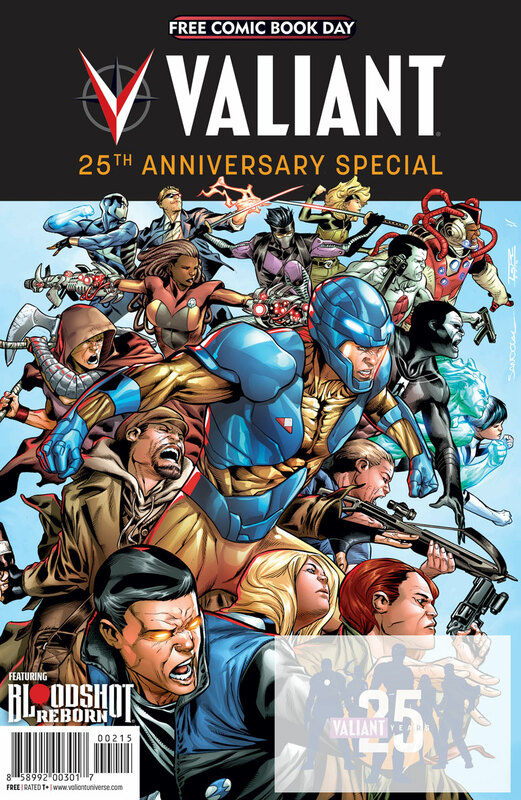 The Valiant 25th Anniversary Celebration Begins in May! Valiant’s 25th year is going to be the biggest one yet! The silver anniversary celebration begins this May on Free Comic Book Day 2015, and continues all summer long with monumental new releases honoring Valiant’s historic place in comics history – and laying the groundwork for another 25 years to come! 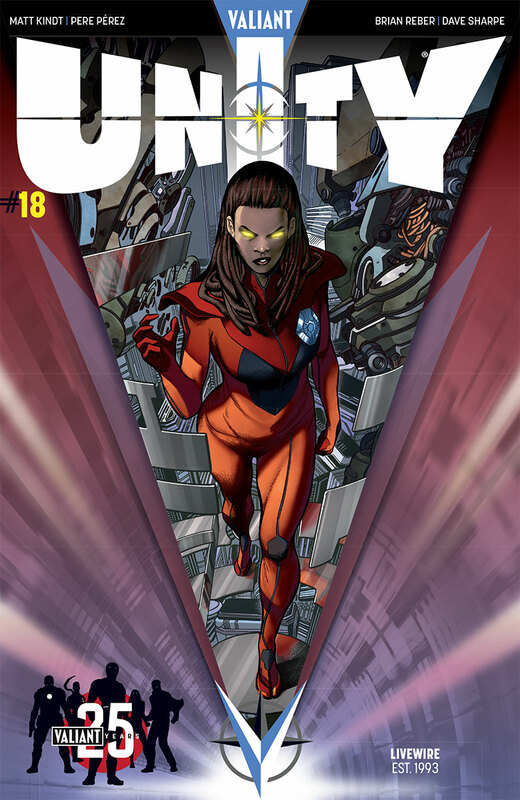 In 1990, the first Valiant comics hit the shelves and, then, the impossible happened – an upstart, independent company created a new, cohesive universe that managed to go toe-to-toe with the industry’s biggest publishers, forever changing the comics landscape in the process. 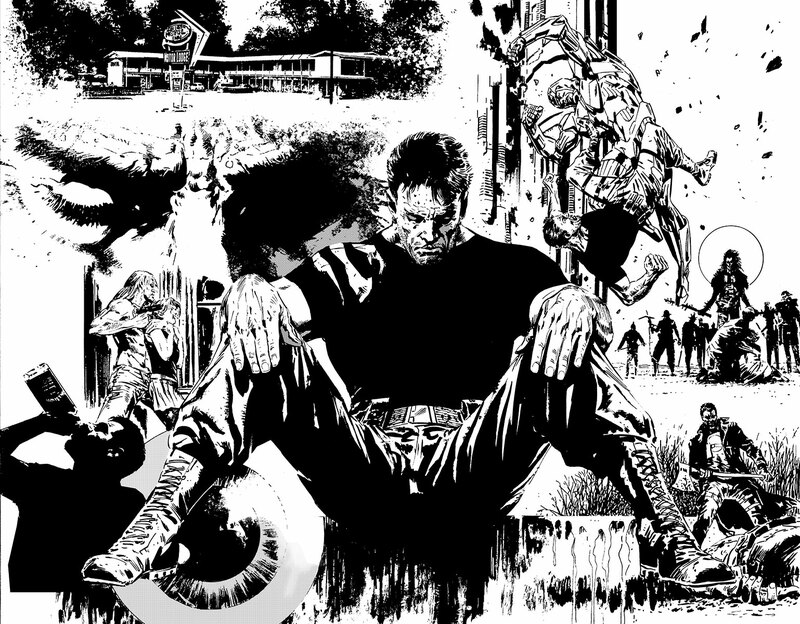 Some of comics’ greatest talents – Jim Shooter, Bob Layton, Barry Windsor-Smith, and more – joined the ranks with a who’s who of up-and-comers – including David Lapham, Joe Quesada, Jimmy Palmiotti, and Sean Chen – to build one of the first true legends of the modern age of comics. Quickly becoming one of the most recognized comic book companies in the world with more than 80 million comics sold, Valiant became the first publisher to ever approach Marvel or DC in scope and sales. 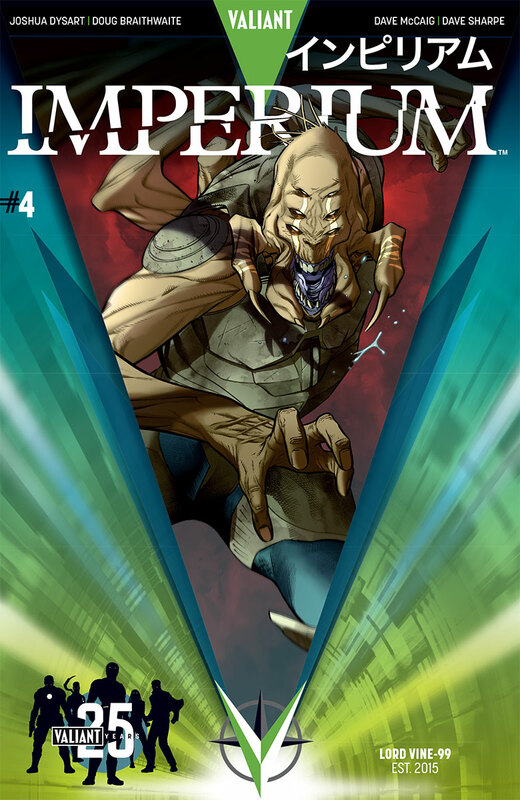 In turn, Valiant’s now-classic characters – X-O MANOWAR, BLOODSHOT, HARBINGER,ARCHER & ARMSTRONG, RAI, and dozens more – became a pivotal force in comics fandom, reshaping the industry with a character-first approach to comics storytelling and creating what would eventually grow to become the largest independent universe anywhere in comics. 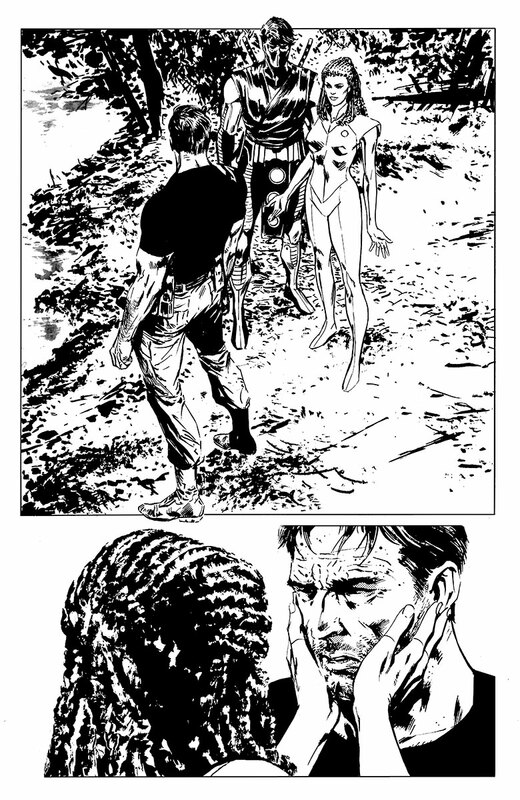 Now, two and half decades on from those monumental origins, Valiant is proud to announce the Valiant 25th Anniversary celebration – a months-long commemoration of the indelible heroes, volatile villains, and world-class creators that shaped Valiant into one of the most celebrated publishers in comics history. Spanning an all-star cast of Valiant’s talents past and present, this summer’s celebration of 25 years of Valiant begins on Free Comic Book Day with the Valiant 25th Anniversary Special, and will continue with all-new new releases across Valiant’s monthly publishing line in print and digital, hardcover and trade paperback catalog, and roster of licensed merchandise. “Even after two decades, many of the innovations Valiant brought to the industry shortly after its arrival in 1990 continue to be felt today,” said Valiant CEO & Chief Creative Officer Dinesh Shamdasani. “For the 25th anniversary, we’re celebrating that spirit of creative freedom that made Valiant such an influential force in the first place, and honoring those that made it possible for us to continue the mission of making the best superhero comics in the industry. 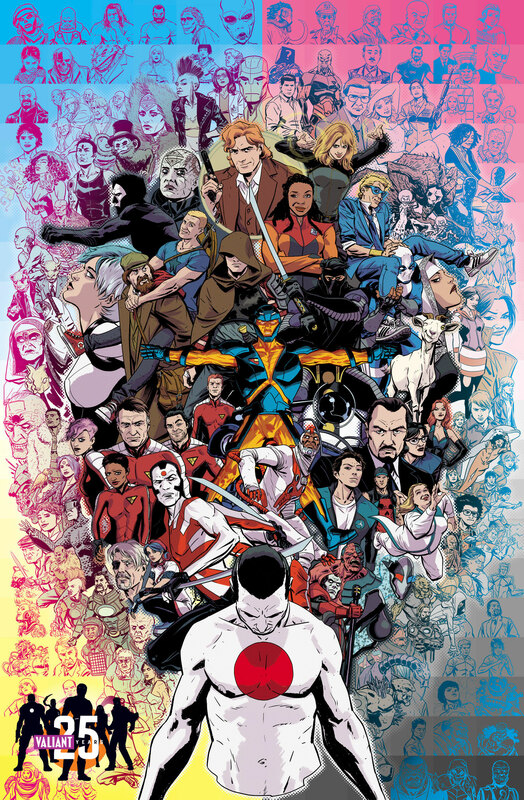 The year’s can’t-miss celebration officially kicks off on May 2nd in the FCBD 2015: VALIANT 25th ANNIVERSARY SPECIAL – featuring two all-new stories and a myriad of never-before-seen special features chronicling Valiant’s storied place in comics history! 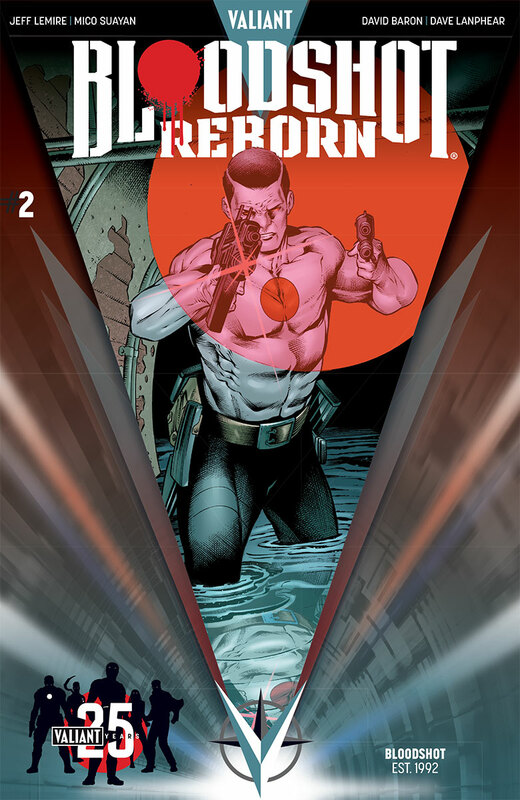 First, New York Times best-selling writerJeff Lemire and blockbuster artist Butch Guice chronicle the devastating fallout of THE VALIANT as Bloodshot rises from the ashes to unleash a never-before-seen prelude to BLOODSHOT REBORN! Then, Valiant superstars Robert Venditti and Rafa Sandoval throw down the gauntlet for an action-packed introduction to the world of X-O MANOWAR and an all-new tale of DEAD HAND! Plus: NINJAK;IMPERIUM; DIVINITY; IVAR, TIMEWALKER; RAI; special guests from throughout Valiant’s decades-long history; and a cavalacade of special surprises! The Valiant 25th Anniversary celebration continues throughout the summer with a host of new offerings in May and beyond, beginning with two very special places for fans to discover Valiant’s biggest heroes! 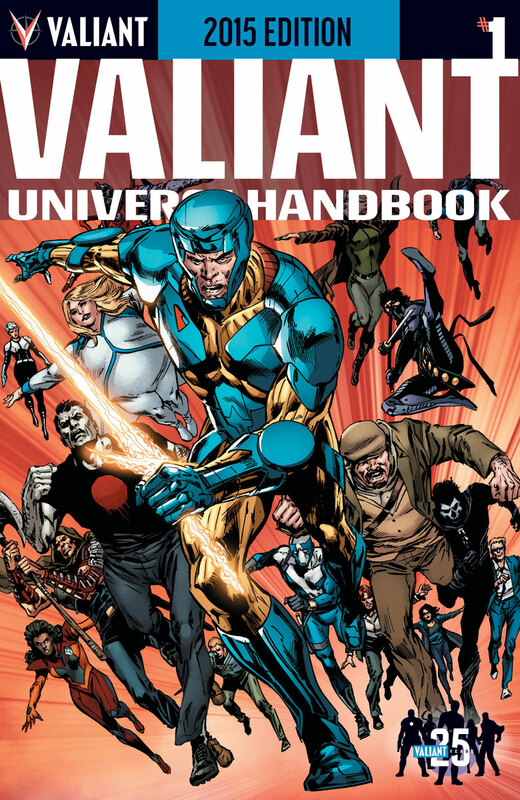 First up, don’t miss the all-new VALIANT UNIVERSE HANDBOOK: 2015 EDITION, spotlighting everything you need to know about Valiant’s heroes – who they are, what makes them tick, and where they’re headed next! Featuring highly detailed and thoroughly updated entries on all of Valiant’s most important players, discover everything you need to know about Valiant’s award-winning publishing line here — just as the 25th Anniversary celebration begins in full force! Then, get up close and personal with the legendary origins behind Valiant’s most indelible icons in theVALIANT: ZEROES & ORIGINS trade paperback collection, re-presenting each of Valiant’s greatest zero issue introductions to X-O MANOWAR, BLOODSHOT, HARBINGER, SHADOWMAN, and more from a world-class cast of creators including Joshua Dysart, Matt Kindt, Lewis LaRosa, Clay Mann,Peter Milligan, Mico Suayan, Robert Venditti, and many more! Plus: don’t miss a very special new series of Valiant 25th Anniversary variant covers by red-hot artistRafa Sandoval showcasing a diverse cast of heroes and villains from across 25 years of Valiant history beginning in May! A special series of alternate shelf covers featuring Valiant’s ever-growing line-up of heroes new and old, look for these Valiant 25th Anniversary variant covers on your favorite Valiant titles all summer long. May 2015 is only just the beginning… Stay tuned for even more exciting Valiant 25th Anniversarynews and releases in the weeks and months to come! 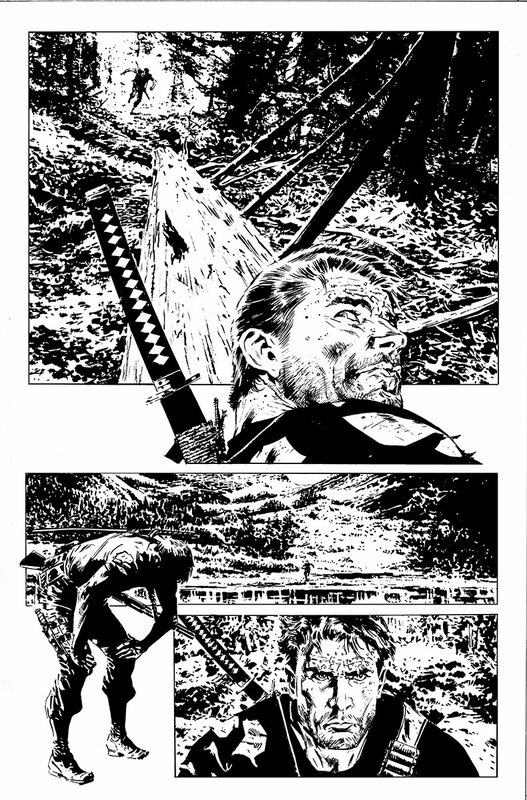 For more information, visit Valiant online at Facebook.com/ValiantComics, Twitter.com/ValiantComics,ValiantEntertainment.Tumblr.com and ValiantUniverse.com.